Updating all the softwares on the computer and the peripherals — my scanner is out of luck and won’t function until someone writes the appropriate code — is a reminder about the necessity of staying current, the threat that hangs over all aspects of contemporary life. There’s the good news — see The Proactive Artist, Ryan Lammie — and then if you read this opinion from The New York Times, Slaves of the Internet, Unite! by Tim Kreider, you get a sense of the more difficult environment in which artists are trying to thrive. It is exaggerated with the advance in connectivity and its demands. Staying Current as a condition, however, is based on a false premise which haunts most of us beyond our iPhone updates. Fashion is built on it as is cable news. It is a special burden on the creative person who needs time to develop and hear his voice. Unfortunately, fearful academics are virulent broadcasters of this condition. To salve their own doubts, I suppose, they foist their fears on the innocents they teach. It is a destructive tactic in art education. Rather than honor a creative need and the time it takes, the anxious academic, beams out anxiety like left-over gravy on everything. “Is this contemporary?” he asks the bewildered student who can barely manage a brush. It is much easier to create anxiety than to offer positive suggestions of hope for maintaining a creative center and the long journey toward competency and self-expression. Any time an artist is out of touch with his own deep studio practice, staying current means something akin to doing everything and valuing nothing. Last week, my former student and Pratt alum, Ryan Lammie, kindly spent two days on campus visiting my Senior and Junior Seminars and my Thesis Painting class. He came in from Pittsburgh and did this service gratis for us as have other young artists in the past. Students are dulled by hearing faculty talk about what life will be like on the outside after they graduate, and worse, they never believe us. More authentic to them are young artist-alums who return and speak of their experiences. Ryan was one of three students who developed a major show, Pratt-Harlem, and quickly drew in other colleagues with a wide array of skills. It was a collaboration between Pratt Thesis Painting Students, the Pratt Painting Club and P.A.L. the Graduate MFA student organization and the Harlem Community. Everything they did was student organized and faculty hands-off. From first meeting to take down of the show was eight weeks. They did it all themselves. It was an amalgam of creative energy, cooperation, organization and focus. Ryan went on that summer to the Yale-Norfolk Program and after returning to Brooklyn, decided that there had to be a more viable and creative way to thrive as a artist than live in Brooklyn which had become very expensive. It is a few years later that he returned to campus having started an artists’ collective named Radiant Hall in Pittsburgh. He shared with my classes what he has learned in this time. Go the the website and see what is possible when people work together for an end that benefits each and every participant. What I remember most were his words that they organized this affordable space around the artist’s individual needs, case by case, not developing a space and forcing the artist to fit into it. I hope these smart ideas will be shared and planted in other communities. 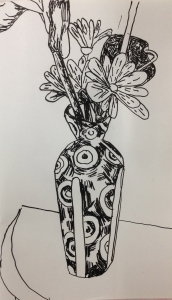 The act of drawing is both intensely focused and calmly meditative. Drawing is the one creative act that is always available no matter where you are or what tools you have. An extension of the finger, a drawing is the most primal of all first utterances of the soul. The thought before it is a thought, it expresses an idea before it is even formed into language. Curious to me is the over-worked term, mark making, which is favored in almost every sentence where drawing is included in academic programs. It seems meaningless for its vague generality and imprecision at the same time it alludes to some primal hitting of one rock against another to make a mark which either forms something, a tool, an axe, or says simply, “I’m here!” as early man might have done. Although I haven’t researched it, it would be my bet that the term rose in use at the time that art school drawing standards which had included surface anatomy and accurate rendering of the seen world, was being replaced by the unfortunate term “creative” drawing programs which were anything but creative and required no similarity to reference as current critical ideas were gaining traction in colleges and university programs. Admittedly it is a particular bugaboo of mine — I have started to count the number of times it is used in crits and surveys — when one can reach more closely to describe what is happening in a drawing. I see these placid drawings described as mark making where there isn’t even a distant echo of the intensity or necessity that the neanderthal’s mark attained. Words do matter and especially when trying to describe a practice so essential to the nature of an art. On October 3rd, we debuted an informal series, A Conversation among Painters, at Pratt. Nancy Grimes and I hatched this idea last spring, realizing that although formal situations — panels, lectures — give valued experience to painting students, the spontaneous conversation among artists is rarely shared with them. We wanted to create an environment where artists sit informally and talk about topics they feel passionate about. Artists Hannah Barrett and Frank Lind completed our group. We met last Thursday during lunch. Balthus, the enigmatic painter of big themes and troubling narratives, was our topic. Students packed the room. We had a few images on the screen and easily fell into the issues, agreeing, disagreeing as we tried to plumb the depths of this singular artist and our reactions to him. Painting colleagues who joined us added more. Young painters rarely have access to this kind of conversation among the artists who teach them. The Balthus Exhibition at The Met, Cats and Girls, is on view until mid-January 12, 2014. More on this exhibition next week. 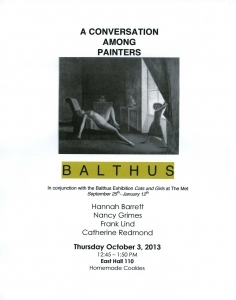 A group of Painting Faculty at Pratt discuss Balthus whose work is on view now at The Met.